We are armpits deep into the dog-days of summer now, pulling to the middle of August. It’s been a warm season with lots of activity in the backyard garden for Tahoe. Her moulting process continues to be a delight to me as her colors continue to change and enhance her appearance. She is beautiful! Her new coat of fresh clean adult plumage is in perfect condition and she looks exceptionally darker than she did as an immature hawk. 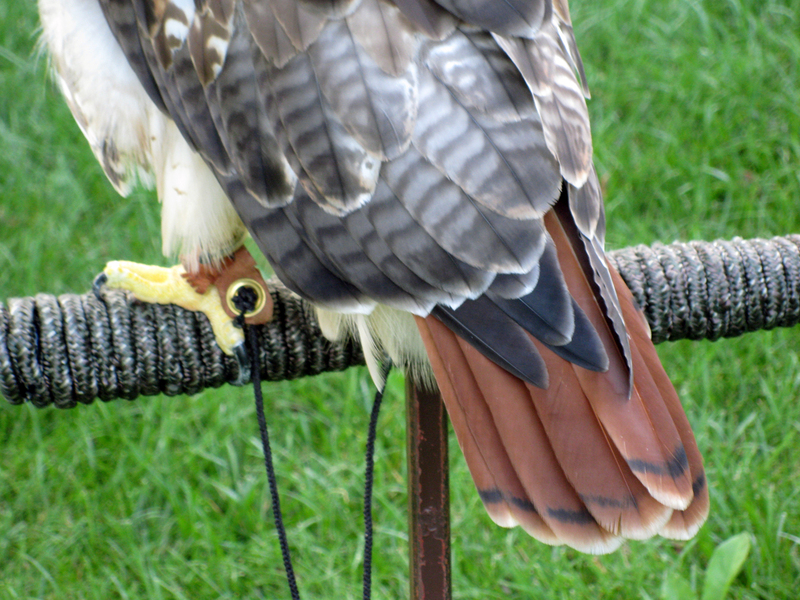 Her red tail really stands out and certainly the most noticeable feature of her adult plumage. Her red tail is mostly full, with a few feathers left to grow in to their full length. You can notice on the back feathers and the secondaries in the wing, the contrasting colors that her new feathers have against the old ones. I’m super excited for the onset of the fall hunting season to see what she has retained from last year, and to watch her continue to develop her hunting skills back on the wing for her favorite quarry.